The moon will be in its last quarter phase on Nov. 14, 2014, making it an excellent time for skywatchers to observe Earth's natural satellite. To the casual observer, the moon may be only an occasional highlight in the night sky. But if you track the moon through its monthly phases, you might be surprised by what you see. On Friday (Nov. 14), the moon will arrive at its last quarter phase at 10:15 a.m. EST (1515 GMT), when its disk will be exactly 50-percent illuminated. It comes just over a week after the full moon of November, which occurred last week on Nov. 6. This is because the moon is not a smooth sphere, but has a myriad of craters, mountains and valleys which cast long, distinct shadows across the lunar landscape. Interestingly, a first quarter moon is actually slightly brighter than a last quarter moon, because at first quarter the illuminated half of the moon displays less of the dark surface features known as the "maria" (pronounced măr-rēa) popularly referred to as lunar "seas." And believe or not, it isn't until just 2.4 days before or after a full moon that the moon actually becomes half its most brilliant brightness! The moon's phases come in cycles, the most noteworthy being the so-called Metonic cycle that was independently discovered by the Greek astronomer Meton (who was born about 460 B.C.). This is a 19-year cycle, after which time the phases of the moon are repeated on the same days of the year, or approximately so. Take, for instance, the full moon that occurs next month on Dec. 6. In 19 years, (that would be the year 2033) there will be another full moon on Dec. 6. Here's another interesting cycle: After two years, the preceding lunar phase occurs on or very nearly the same calendar date. Thus, in 2016, it will be the first quarter moon that will occur on Dec. 7. After eight years, the same lunar phases repeat, but occurring one or two days later in the year. The Greeks called this eight-year cycle the "octaeteris." Indeed, in 2022, a full moon occurs on Dec. 8. Finally, in our Gregorian calendar, 372 years provides an excellent long period cycle for the recurrence of a particular phase on a given date. So we know with absolute certainty that the same full moon that shines down on us on Dec. 6, 2014 will also be shining on Dec. 6 in the year 2386. Earlier this month, on Nov. 9 to be precise, marked the 49th anniversary of the Northeast Blackout of 1965; a major disruption in the supply of electricity affecting parts of Ontario, Canada as well as Connecticut, Massachusetts, New Hampshire, New Jersey, New York, Rhode Island, and Vermont. More than 30 million people spread out across 80,000 square miles (207,000 km) were left without electricity for up to 13 hours. In the aftermath of the blackout, the mainstream media pointed to one major saving grace: a bright full moon that lit up the cloudless skies over the entire blackout area, providing some aid for the millions who were abruptly plunged into darkness. The moon, however, was not full that memorable night, but actually in its waning gibbous phase, full moon having occurred the night before. For me, as a budding 9-year old amateur astronomer, having the moon in the sky on the night of the big blackout was not a fortuitous circumstance, but was instead a tremendous disappointment. 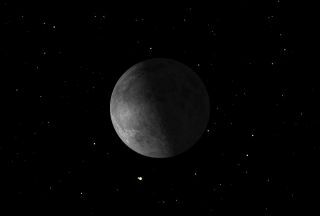 For thanks to the presence of that brilliant moon during the early evening hours on "blackout night" nearly half a century ago, a large swath of the southern sky appeared almost devoid of any stars. The moon's light effectively drowned out most of the faint autumn stars and constellations. It wasn't even a good night to look at the moon itself if you owned binoculars or a telescope. Normally, even with just small optical power we can see a wealth of detail on its surface. Once the moon reaches its full phase, it appears flat and one-dimensional, despite shining bright to unaided eye. But in the days that followed the blackout, as the moon waned to a gibbous phase and then to last quarter, those lunar features lying close to the terminator — the variable line between the illuminated portion and the part of the moon in shadow appeared to increasingly stand out in sharp, clear relief. Weather permitting, that memorable lunar sight is what awaits stargazers on Friday night. Editor's note: If you snap an amazing photo of the moon, or any other night sky view, and would like to share it with Space.com for a story or gallery, let us know. You can send in photos and comments to: spacephotos@space.com.